Flimkien għal Ambjent Aħjar is organisting private tours of San Anton Palace and its beautiful staterooms, which are rarely open to the public. 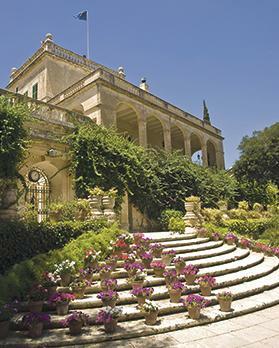 These tours are being organised in conjunction with the Sustainable Regeneration of Built Heritage initiative – led by architect Amber Wismayer under the auspices of the President – which adopted San Anton Palace as a case study in safeguarding Malta’s architectural legacy through sustainable interventions and sensitive, adaptive re-use. In addition to touring the staterooms, Wismayer will explain how Maltese heritage buildings incorporate passive environmental design strategies such as natural ventilation, orientation towards the sun, thermal mass and shading. The use of traditional features such as the loggia, were developed over the centuries to provide comfortable living spaces for buildings’ occupants. International studies have shown that significant energy savings may be achieved without reducing a building’s cultural and architectural value, offering huge potential in reducing national energy demands. San Anton Palace was originally built in 1620 as a country retreat for Grand Master Antoine de Paule and embellished over the centuries. Thus the different functions of this working palace must merge harmoniously with the highest standards of heritage protection, presenting a challenging case study. After the tour a short lecture by Wismayer will be given, explaining how the Palace’s original features were incorporated to improve comfort by maximising the benefits of passive strategies while safeguarding the building’s heritage value. This will be followed by tea/coffee/wine and refreshments for tour participants. Tours will be taking place on Saturday at 5pm and 6pm. Patrons are requested to arrive 15 minutes before their tour. A €20 donation for the tour is being requested, which includes a donation to the Community Chest Fund. Bookings at https://ticketengine.faa.org.mt/.